Bonus lesson time! Today we'll be going over the pendulum magician archetype and the odd-eyes archetype. Now enough chit chat, on with the lesson. This hybrid archetype build focuses around pendulum summoning of course, with the additional focus on summoning odd-eyes pendulum dragon mainly, as well as his extra deck variants. The Magicians focus on protecting your monsters, and or hindering your opponent's cards while supporting odd-eyes and his other dragon counterparts. Strengths his deck has includes field swarming, pendulums...duh, recycle/search mechanics, and a few lock down mechanics that prevent effects from being activated at specific times, or destruction prevention. Weakness includes cards that block special summons like vanities, and anti spell fragrance, which completely prevents setting the scales. Beware of pendulum summoning when the threat of solemn warning is still playable as it will leave you completly defenseless if it is played against you at the worst time, for you that is. There is nothing worse then having a full field pendulum summoning getting solemned. We'll start off by talking about the Pendulum Magician monsters. Currently there are 10 magician monsters, with 5 pairs of magicians that work in synergy with each other to focus on a specific game mechanic or summon method. Do note that some of these are not yet available in real life, but will be discussed none the less. Those original duo who gaze time and stars. These two were the original duo and staples for pendulum summoning along with odd-eyes. Star and time gazer both have a similar pendulum effect were if there is no magician or odd eyes in the other scale, their scale is set to 4. Also Timegazer can not be activated while you control a monster. Both of these monsters support battling pendulums while their in the scale, with star preventing your opponent from using spells, and time blocks your opponent's traps. On the field timegazer prevents your scales from being destroyed once a turn, while stargazer lets you resummon any 1 pendulum monster that gets bounced to your hand, say from being compulsed. The Magicians Who Call Forth Rebellion. Synthesis and antithesis support the ability to xyz summon, mainly to help summon odd eyes rebellion dragon. Sythesis's power targets one xyz monster you control and 1 level 5 or higher monster, the xyz monster's rank is then equal to the level of the 2nd target when that xyz monster is used for an xyz summon. 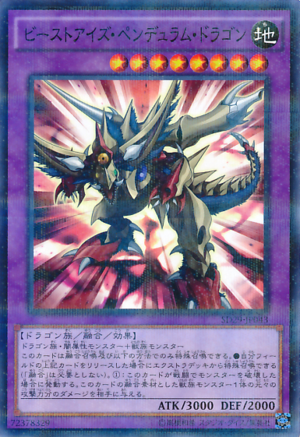 Antithesis's effect makes an xyz's monster to be allowed to be used in an xyz summon with it's rank to be considered a level. On the field antithesis is a decent beater that can negate any light monster for the remainder of the turn. Synthesis's effect lets her attack equal another monster's on your field, how ever she does not do any battle damage. A warning, synthesis as a pendulum scale is a double edge sword, if you control more cards then your opponent her scale is reduced to 4 so be careful. These Magicians focus on recycling pendulums and synchro summoning. Peasant is the recycler of the pair, while in the scales, if you have a magician in your other scale, you can return a face up magician or odd-eyes in your extra deck to your hand. If summoned you can return the same kind of monster from your grave to your hand. For noble magician,while in the pendulum zone, if you don't control a magician in your other scale, she self destructs. While in your hand or graveyard, if you control a level 7 or higher odd eyes monster, you can reduce that monster's level by 3 and special summon this card. This is also a tuner monster, meaning she is, currently, the only tuner magician monster. If she is used for a synchro summon that is not a dragon type monster, she is sent to the bottom of the deck instead of the extra deck. It is advised to restrain yourself from using noble as a pendulum scale, due to her low scale, and the fact she doesn't have any effect except her self destruction. Dragonpit is a pure defense wall while Dragonvein is a low level semi beater monster. Oddly enough their both normal monsters and have no field effects. Their scales are far and wide with no restrictions or risks. Meaning there is no conditions to keep their high/low scales, meaning they can work in other pendulum decks just for their large scales and generic pendulum effects. Both have destructive effects while in the scales, were if you have another magician in your scale you can discard one pendulum monster to destroy a spell/trap, for dragonpit, or a face-up monster, for dragonvein. Natrually both of these effects are once per turn effects. These guys assist your pendulum scales mainly, either buy adjusting the weight of either scale, defending fellow pendulum monsters from destruction, or replacing themselves for another magician. Insight magician's effect destroys himself in the scale while theres a magician in your other scale, and the places any magician pendulum monster from your deck in the scale he was occupying. Note that this effect can be used on timegazer if you control a monster, and you can use this effect if insight magician is in both scales, and lastly there isn't a turn restriction on this effect, meaning you can use both of their effects in the same turn. His monster effect has you discard him to the grave to target a pendulum monster in the pendulum zone who's scale is not it's original value, and then set it to it's original value. Example, a pendulum monster's original scale is 8, and its currently 4, their scale is forced back to 8 with this effect. This effect overrides any passive effects and lasts the turn unless a future effect adjusts this scale. Oversight magician allows you to reveal any pendulum monster in your hand, then target 1 pendulum magician in your scales, their scale is then equal to the revealed monster's. When pendulum summoned he prevents the destruction of any pendulum monsters on the field for that turn as long as he is on the field. When building your deck, its best to make sure each pair of your magicians are equal, except for insight magician, he is best run at 3 as his pendulum effect is extremely beneficial. Odd-Eyes monsters are one of the very few archetypes that have a monster represent every possible summon method, tribute/special summon, fusion, synchro, xyz and pendulum. While a few of these won't appear in a pendulum deck, they are still part of the odd-eyes family and won't be left out. Now put your hands together and welcome... our main attraction! One of the wonders of the dragon world, the spectacular! The original, O.G., ghetto, vanilla, Odd-Eyes monster. You won't ususally be running this monster in a pure pendulum deck, however for a chaos saber deck, he would definatly be included. Swing, pendulum of souls! Draw an arc of light across the ether! Pendulum Summon! Appear now with your wondrous and beautiful dichromatic eyes. Pure Strength beater on the field that deals double battle damage against monsters, but on the scales, he's even more important. His half battle damage effect is rarely used, due to the fact that people use his 2nd effect more often. The 2nd effect is during the end phase you can destroy this pendulum zone card to add any pendulum monster with 1500 attack or less. This effect is completely generic and can be used on any pendulum besides magicians. This is one of the stars of your deck so he should be run at max. Go Oh Dichromatic Eyed Dragon! Become Infused With The Power Of The Heavens! Now Descend! Like Odd-Eyes Dragon you wont be using this guy in a standard pendulum deck. With an interesting summon method, by tributing a light monster and sending an odd-eyes dragon from your hand field or deck to the grave. When he destroys a monster and sends it to the grave you can instantly destroy another monster. With 2800 attack he'll be able to run over almost anything, and for those monsters he can't run over he can just destroy another monster to destroy that which can't be run over. Wielder of mysterious powers, become the bright light in the eyes of the dragon! Fusion Summon! Come forth! Arcane dragon wielder of ancient magic! 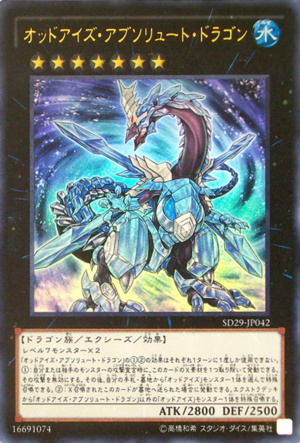 The first Odd-eyes fusion revealed, and can be fusion summoned with odd-eyes pendulum dragon and any spellcaster. Additionally if he is summoned with just 1 pendulum summoned monster he is unaffected by your opponent's card effects the turn its summoned. Lastly if summoned with a pendulum spellcaster as a fusion material it gets to attack twice, if a level 4 or lower was used, or three times if a level 5 or higher was used. Note you can only multi attack on monsters, not directly. Prideful silver wolf. Become one with the arcane dragon to create a new power! Fusion Summon! Come forth! The ferocious dragon with luminous feral eyes! Truly a beast of a monster with 3000 attack ready to destroy everything it sees. This monster does not require a polymerization to summon as it can be summoned with contact fusion as long as you control a beast and a dark type dragon, meaning you don't require an odd-eyes for this guy. When he destroys a monster your opponent will take damage equal to the beast's original attack, that was used in it's summon. Oh Dual Eyed Dragon, Become Infused With The Power of Wind And Blow Away My Foes! Storm Forth! Incase you haven't noticed, it seems Odd-Eyes is stealing a maneuver from the E-Hero playbook by infusing odd-eyes with various elements. Saber was light and this is one is wind. When special summoned, note i said special not fusion, you can bounce a face up attack position monster your opponent controls. Additionally you can shuffle 1 extra deck face up monster to your deck and negate the activation of a monster/spell/trap card and destroy it. Seems like it's stealing a play from Quasar as well. 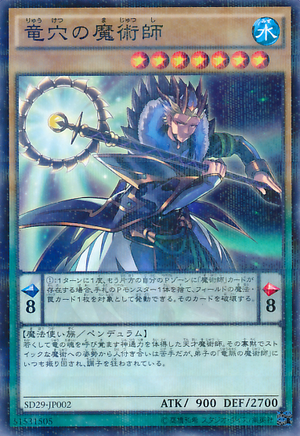 Like Vortex Hiss effect activates when he's "special summoned". When he is special summoned you can special summon a monster in your pendulum zone, but this monster can't attack if he does so. Lastly his continuous effect. Your opponent cannot activate monster effects during the Battle Phase. If you have time and star gazer while this guy is in play, your opponent can not do anything should you attack. Awaken Twin-Eyed Dragon From Your Sleep In The Deepest Ocean, Ascend And Submerge Your Foes In A Great Wave! It is suggested to xyz summon this monster with atleast 1 odd-eyes monster, as you detach to negate any attack, then special summon an odd-eyes, including one you just detached for the cost of this effect. Should this card be xyz summoned, and sent to the grave you can special summon any extra deck odd-eyes monster, including the fusion and synchros, and even Odd-Eyes Rebellion Dragon! Speaking of which. This is your Ace monster hands down. When summoned correctly he will obliterate your opponent's field. When summoned using an xyz dragon monster as material all level 7 or lower monsters you opponent controls will get destroyed and then your opponent takes 1000 for each. To make matters worse he can attack 3 times, even directly should this be successful. This only applies to the turn it's summoned. 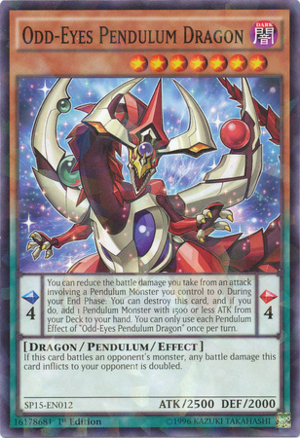 Should he be destroyed by battle or card effect, and not banished or bounced, you can destroy your scales and set him in one and during your turn if he is in your scales you can set any pendulum monster in your pendulum zone from your deck. Lastly should he be face up in your extra deck he can be pendulum summoned if you can pendulum a level 7 monster. Target 1 card in either player's Pendulum Zone, and declare a Pendulum Scale from 1 to 10; this turn, that card becomes that Pendulum Scale. Can be used against your opponent or reset the scale of one of your magician's who's scales are not their original values. Once per turn if a monster you control is destroyed by battle or card effect, draw 1 card. Useful when you have to play defensively. Since you can resummon pendulum monsters if their destroyed you can create a spam-able shield wall of monsters and gain extra draws till you get cards that will let you counter attack. Shuffle 3 Pendulum Monsters into the Deck, from your Graveyard and/or face-up in your Extra Deck, then draw 2 cards. You can only activate 1 "Pot of Riches" per turn. You cannot Special Summon the turn you activate this card, except by Pendulum Summon. While it restricts your summon methods for a turn, its a useful recycle card. Destroy as many cards in the Pendulum Zones as possible, then apply these effects and resolve in sequence, depending on the number of cards destroyed. ● 2 or more: You can add 1 Pendulum Monster from your Deck to your hand. ● 4: You can add 1 "Swaying Gaze" from your Deck to your hand. Given the vast Variety of Pendulum Magicians this card is extremely helpful to get the right magicians at the right time. 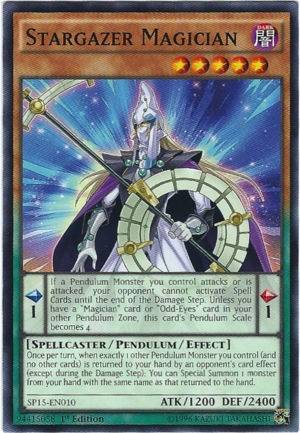 If you have not activated the Pendulum Effect of a "Magician" Pendulum Monster previously this turn: Discard 1 card; add 2 "Magician" Pendulum Monsters with different names from your Deck to your hand, also "Magician" cards in your Pendulum Zones cannot be destroyed by card effects until the end of your opponent's next turn. You can only activate 1 "Pendulum Call" per turn. Talk about an overpowered card. Not only does it allow you to use pendulum effects after it's used but it gives you 2 different magicians. However the anti destruction effect is a double edge sword as it blocks insight and swaying gaze's effects the turn call is used. 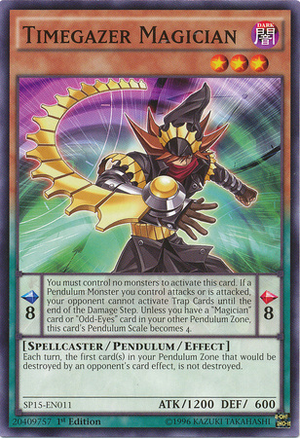 "Magician", "Performapal", and "Odd-Eyes" cards in your Pendulum Zones cannot be targeted by an opponent's card effects. You can target 1 other face-up card you control; destroy it, and if you do, add 1 "Odd-Eyes" card from your Deck to your hand. You can only use this effect of "Sky Arc" once per turn. Protects your scales from your opponent's spell/trap destruction cards like MST, but not heavy storm/harpies feather duster. The Search mechanic is useful to get not only odd eyes monsters but cards like odd-eyes fusion. 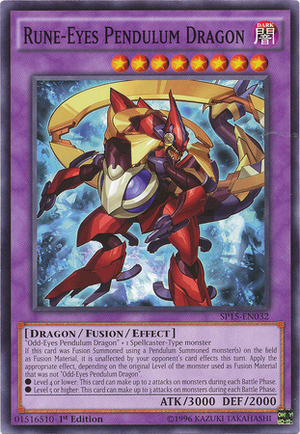 Fusion Summon 1 Dragon-Type Fusion Monster from your Extra Deck, using monsters from your hand or your side of the field as Fusion Materials. If your opponent controls 2 or more monsters and you control no monsters, you can also use up to 2 "Odd-Eyes" monsters in your Extra Deck as Fusion Materials. You can only activate 1 "Odd-Eyes Fusion" per turn. Do be careful when you use the 2nd effect to fusion summon as your extra deck monsters will go to the grave, however you can use any odd-eyes so they could be revived later if you bring out absolute dragon. If you have 2 cards in your Pendulum Zones: Target 2 monsters in your Graveyard, each with a Level between (exclusive) the Pendulum Scales of the cards in your Pendulum Zones; add them to your hand. Helpful Pendulum recycle card. Target 5 cards in your Graveyard, except "Jar of Avarice"; shuffle all 5 into the Deck, then draw 1 card. You can only activate 1 "Jar of Avarice" per turn. While you can use this to recycle your pendulums you can also recycle useful spells and traps. You can target 1 card in your Pendulum Zone; destroy it, then draw 1 card. You can only use this effect of "Echo Oscillation" once per turn. Helpful to free unwanted pendulum zone cards, while gaining a free draw. Heres a Deck Profile of my Current Pendulum Magician/Odd-Eyes Deck I use on YGOpro as a reference. Thats it for today's lesson I hope everyone will build their own pendulum deck and show the dueling world a spectacular performance.